Be the first to share your favorite memory, photo or story of Martha . This memorial page is dedicated for family, friends and future generations to celebrate the life of their loved one. 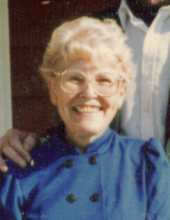 MOREHEAD CITY: Martha H. Eubanks, 88, passed away on Wednesday, February 06, 2019 at The Gardens of Pamlico in Grantsboro, NC. She was born in Greenville, SC to the late LeRoy Hardin and Pearl Hartsell Hardin. In addition to her parents, Mrs. Eubanks was also predeceased by her husband, Julius Eubanks; son, Steve Douglas Eubanks; and 6 brothers and sisters. Mrs. Eubanks was employed for 10 years with U.S. Army Research. She retired after 21 years of employment with the Environmental Protection Agency. Mrs. Eubanks is survived by her daughter, Kathleen Brown (Preston); grandchildren, Myles Brown (Beth), Steve Douglas Eubanks II (Laura), Patrick Dell Eubanks; and great-grandsons, Steven Brown and Daniel Brown; and daughter-in-law, Bonnie Eubanks. The family will receive friends Saturday, Feb. 9, from 12:30 – 1:30 at Clements Funeral Services, 1105 Broad St., Durham, NC, followed by a grave-side service at Maplewood Cemetery, 1621 Duke University Road, Durham. In lieu of flowers, memorial donations can be made to an organization for the blind. To send flowers or a remembrance gift to the family of Martha H. Eubanks, please visit our Tribute Store. "Email Address" would like to share the life celebration of Martha H. Eubanks. Click on the "link" to go to share a favorite memory or leave a condolence message for the family.